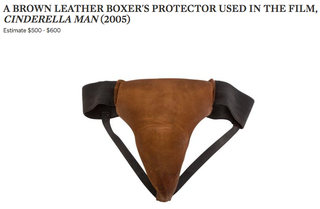 As daytime news laden with White House hoopla and real-world horrors fades into the drunken oblivion of evening, it’s time to address the elephant in the room: Russell Crowe’s jock strap (brown leather boxer’s protector used in the 2005 film Cinderella Man), which fetched around $5,400 at Sotheby’s in Sydney “after intense bidding,” according to the Guardian. I suppose it could have a useful second life as a fannypack or slingshot. A basketball cozy, if we’re being creative. But when you turn it around, the item appears to be well-worn, presumably adding to the inherent value of having briefly contained Russell Crowe’s (EW) peen. Maybe it’s just the kind of gag item the wealthy pass around the friend group, like a rich woman’s plastic dog poo. Haha, gross, Wysteria! Whatever it is now, the jock strap was one of many Russell Crowe film memorabilia which hammered for a total of $2.8 million in Crowe’s divorce garage sale on Saturday (“The Art of the Divorce”). (There was also the armor from Gladiator and a 128-year-old violin from Master and Commander, but really, it’s about the thong). Divorce has its way of making you really examine the things that are essential in life — and the things that are not. Through the process I had a look around and realized I had a lot of stuff. Career stuff, stuff I’ve collected, and stuff in general. Boxes and boxes of stuff…so in the spirit of moving forward into fresh air, here’s a portion of that collection of stuff. Really makes you think about what things are truly worth in life.